In the last year Beacon Hill has seen a few new places to eat and drink. One more has been a long time coming but it is open now. The storefront at 15th and Beacon that has borne the sign “Taqueria Frida opening soon” for a very long time (we first wrote about them in November 2010, along with a rumored sushi place that has yet to materialize) finally opened this week with a slight name change to Luisa Taqueria. It’s open daily except Mondays, from 10 a.m. to 9 p.m.
It’s too early to review the taqueria properly, but I stopped by today and can report that the food I tried was tasty. I particularly liked the horchata, which tasted smoother and less watery than at some restaurants. The prices seemed reasonable. I’ll be back. 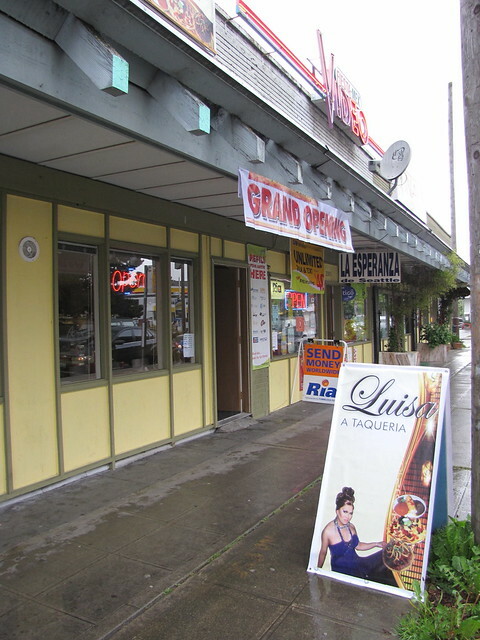 Luisa Taqueria is located just a couple of doors south of Inay's at the junction of Beacon and 15th. Photo by Wendi Dunlap. Ate there tonight for the first time too. It’s a friendly spot with good food, I hope they do well. $5 for three tacos? NOT CRAP. We went there last weekend and had some great tacos and horchata. Will definitely be going back there frequently for some good, cheap food. Welcome Luisa Taqueria!! Went there today and got an awesome portabella veggie burrito. I was impressed with the quality of the ingredients and Gerald’s vision to have a rotating menu of special meat and veggie options (tofu is coming). Although the place is small and non-nondescript and the menu appears limited, the food is really excellent! After reading the prior reviews, I’m not sure what happened with my visit on May 5th. I went in for lunch with a friend and the place was empty. There were no menus and the two workers looked at us without a smile. We felt unwanted and so we left. They did not greet us or acknowledge us, it was really odd. With so many other great places to eat in Seattle, it’s unlikely that I will return after the chilly reception. I’m not sure why they seemed unfriendly — I’ve been twice now, and both times they were very friendly. But as far as the menus go, there aren’t any printed menus as far as I know. The menu is on the white board on the wall. JamesonD, this is a taqueria, not a full-service restaurant. If you walked in and sat down, the workers were patiently waiting for you to stand up and place an order at the counter. The veggie option is very good! The green salsa perfect. Both my kids and my wife got chicken tacos and a chicken burrito, they all deemed them unedible. It looked pretty unappealing from my side of the table as well, a bunch of refried beans, rice, and chicken in a monochrome heap. Be safe and go veggie. Dylan, just curious with the chicken why was it deemed unedible, I’ve had it twice in both tacos and burritos and it taste fine? I knw it may be a personal preference but as reviewers we should shed light on why so they can make the necessary changes to better their new business. I found this place last week and have already been a few times. I have found the food delicious and the service very friendly. The food is no nonsense quick Mexican that reminds me of the Mexican food I used to get in San Diego. I went back today because I had been dreaming of their horchata all week. The menu is on a white board because it’s going to change each week. Andrew. I thought I was pretty descriptive. The food we got did not look like Wendi’s photo. Dylan, what I meant was why was the food not edible( was it dry, too spicy, not just some small description of what you found in the burrito), what is your description of a good burrito? Such beautiful weather that I decided to walk home from First Hill instead of taking the bus, and I couldn’t help but wander in to Taqueria Luisa on my way past. It’s just that kind of day. Had a cup of horchatta and an adobo pork burrito, and a big smile on my face when I left. About the same price as going down the hill to Taco Time, but ten times tastier and you don’t spend the next two hours feeling like you swallowed a grease-slathered rock. If you want a nice sit-down Mexican meal, I still say El Quetzal all the way. But if you’re looking for tasty chow on the go, two thumbs up for our neighborhood’s new taqueria. My husband and I checked it out on Tuesday. We ordered a bunch of stuff to try it out. We loved; horchata, guac, pinto beans, pork adobo (#1), chicken and pork. The carne asada was very bland, and wouldn’t order again (unless they see this and adjust the flavor). It was super reasonable and the young man was very nice. We will def be back!